One of my almost-daily routines is hanging out at Aeclectic Tarot Forum, which is an online discussion board for anyone interested in tarot and wanting to practice their reading skills and intuition in general. I have shifted from other social media to AT, because in the tarot community, the focus is on self-improvement and helping others, whereas Facebook and other platforms are nowadays flooded with bad news, disrespectful language, trolling and other negative traits this species of ours can exhibit. The more time I spend on Facebook, the more agitated and annoyed I get, whereas with AT, the more benevolent and refreshed I feel - it's funny what a big difference the language, attitude and ambience of a forum can make. Because AT is anonymous, people discuss their issues openly. One of the common underlying currents of discussions is "I want to do thing X, but my family/friends/social circles oppose/ridicule/don't approve it". No person is an island and whatever people around us say and think, affects us. positively or negatively. But. How can we ever achieve anything in life, if we put too much emphasis on other people's opinions? For instance, I want to be a novelist one day. I have supportive and encouraging people around, but also those who don't think I can make it. It is possible I can't. But it's also possible I can. And the only way to find out is to give it a proper try - do my best to become what I want to be, even when it comes with the risk of failure. People around us often think they know better, see the risks better, are more realistic than us or otherwise just have more authority to tell how to live our lives. But is that really true? It's actually just a perception. The louder or more convincing these critics are, the more credible they sound. However, being loud or sounding confident don't make anyone right. And nobody else but you can know, whether something is good or right or doable for you. But here's the trick. You need to believe in yourself to make it work - whether this is a new job, relationship, studies or business. Critics around can take that self-confidence away, thus spiralling you to a failure and creating a self-fulfilling prophecy. I told you so! When in fact, if they had not told you so, you wouldn't have failed. Tricky, isn't it? 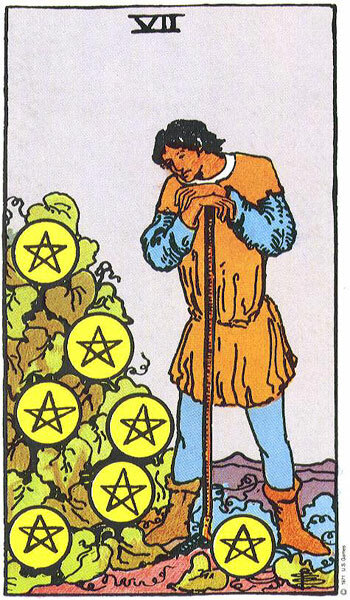 The traditional 7 Pentacles of Rider Waite Smith deck shows a farmer assessing his crop. Only one ripe pentacle has dropped, the rest might still fail or succeed. The only thing to do is to keep trying and hope for the best. 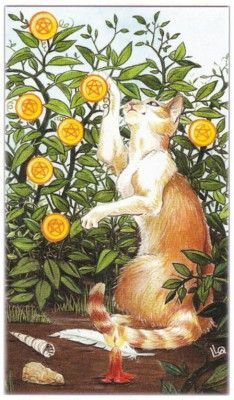 Tarot of the Pagan Cats shows a different side of 7 Pentacles - curiosity and play. Any dream, project or plan in life starts with curiosity (could it work? what if it worked?) and at best, is fuelled by play: fun, exploration, creativity, excitement. Even if the dream fails after all, experiencing those elements on the way make it worth trying. Every farmer knows that the crop might wither and die. No matter how much you've watered, tended and cared for it, it could still fail. But then again, there could be a huge reward, a bounty, a successful harvest. The only way to know is to try - not just half-heartedly, but giving it the best you've got. I value tarot as a tool because looking at the cards and pondering them peels off layers in our thinking that are plastered in there by other people. Looking at the pictures analytically or semi-meditatively should reveal what your real thoughts and feelings about any given matter are, free and pure from others' influence. How could I best make this project work? What are my strengths? What are my weaknesses? What could I do to strengthen the strengths and weed off the weaknesses? How to best go about with this dream of mine? These are all empowering questions that help you forward, instead of dwelling on "I really want to do it and I think I could, but everyone says it's not wise/easy/possible/for me." Well, everyone can say that the sun will be blue tomorrow, but it doesn't make it true, does it? Here's a spread to explore a plan or dream you're unsure about. Pull 1-3 cards for each question, depending on your preferences and reading skills. 1. What do I believe this plan/dream will give me if it works? 2. What is the real reason I hesitate achieving it? 3. How can I overcome my hesitation? 4. What skills I have that will most help me with achieving this? 5. What in my life or thinking is hindering me from achieving this? 6. What will my life be like when I have achieved this? 7. How to best start moving towards this goal? 8. How to encourage myself to keep going until I reach my goal? Hi Berthold, sorry to hear and sorry that I'm not able to be of much help! I don't get much spam at all. One way to prevent it is to turn on comment moderation - that way you can check all comments before they go public and can delete spam before it hits your wall. I know there is a way to block certain IP addresses that spam, but unfortunately I don't know how to do it. Best of luck with fighting that malaise!